I’ve noticed, its not necessarily the ‘big names’ that get a collector’s juices flowing. It often happens to be the more unusual, niche creations. I guess it come down to the desire to own a unique piece of art. This is certainly the case with our Editor in Chief Frank Geelen. Last time we sat down to discuss his collection we covered his beautiful Sarpaneve Korona K1 (one of ten ever made) here. On this occasion it is his HAUTLENCE HL Ti. There are some watches that have a wonderful ability of sticking in your mind. I will certainly never forget the first time I laid eyes on a creation from HAUTLENCE. One thing is for sure, when you see a HAUTLENCE on the wrist, you know it’s a HAUTLENCE! 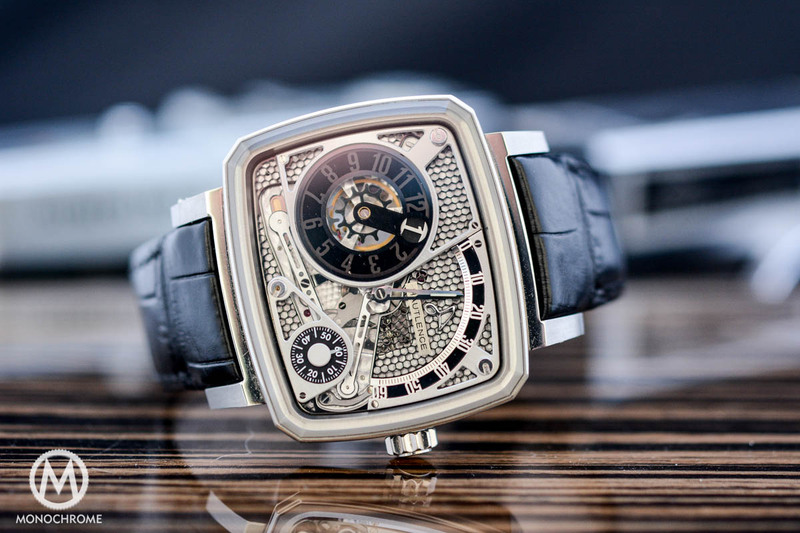 Since 2004, the manufacture have been creating fascinating timepieces that incorporate both bold case designs and technically advanced movements. The name (for those of you who were unaware – as I was!) 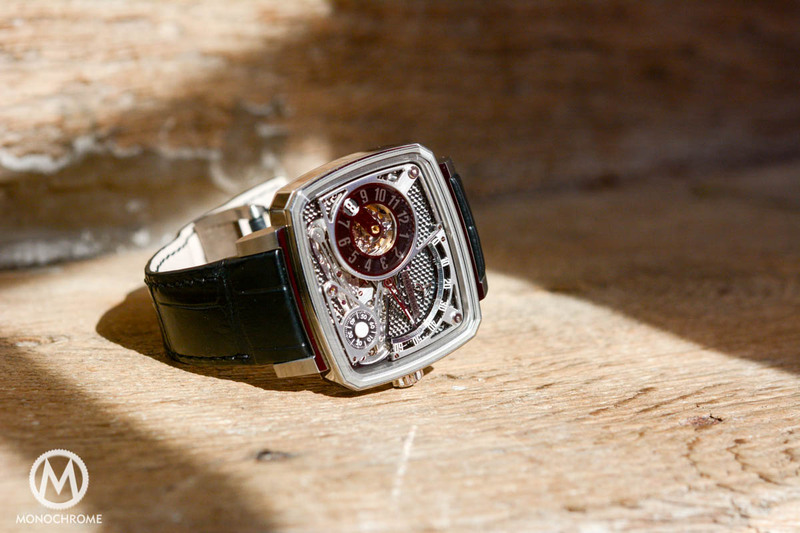 is an anagram of the canton of Neuchâtel in tribute to the cradle of watchmaking. In 2012, HAUTLENCE welcomed Georges-Henri Meylan onto the team and with brand Co-Founder Guillaume Tetu and are driving the business forwards. In this interview we cover how Frank came across the brand, what his favourite feature of the watch is and the three words he would use to describe it! How did you come to own the Hautlence? 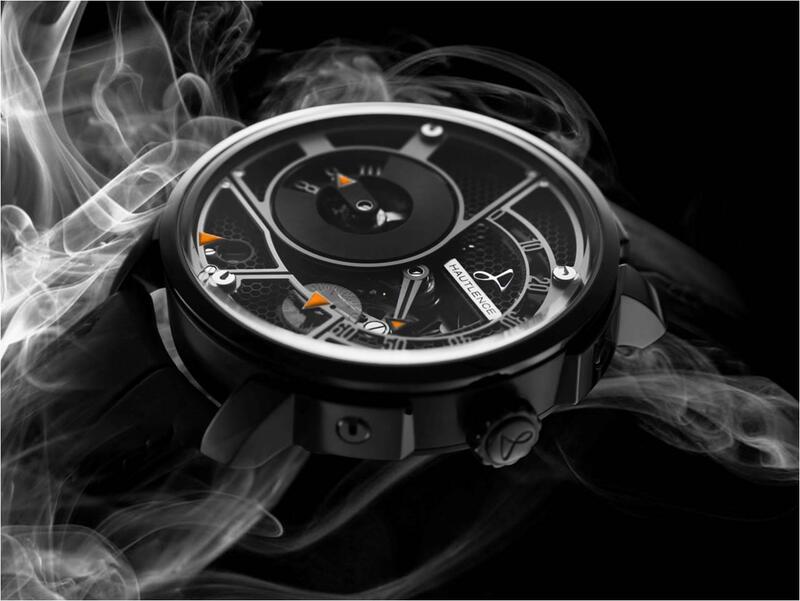 I had seen photos on a forum, and read about a new and spectacular timepiece from Hautlence that was about to be launched. I was already planning to go to Switzerland for a week, and I had the opportunity of visiting a number of Indy watch brands. 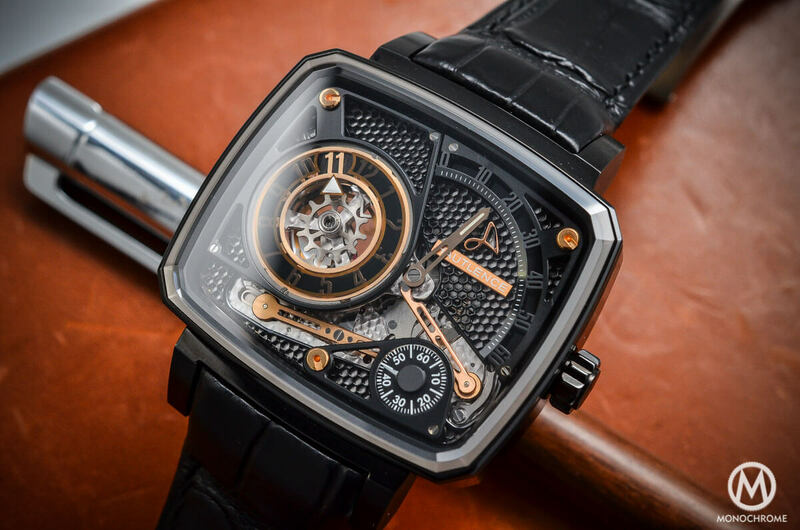 It was certainly a week of horological high-lights! I got to meet with Kari Voutilainen, Stephen Forsey, Thomas Prescher, the folks of De Bethune, URWERK, MCT, Peter Speake-Marin and Hautlence. It showed me an entirely other side of the world of watchmaking than I hadn’t been used to, generally being in contact with either PR or marketing teams from the major brands. 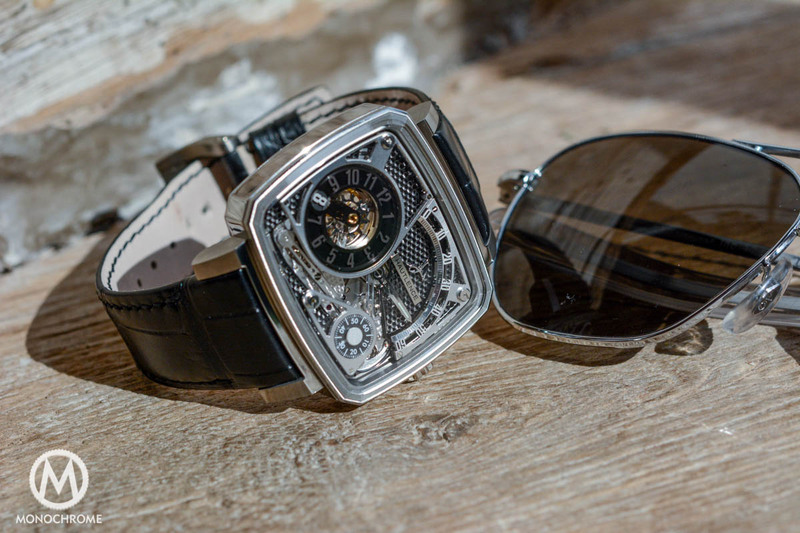 When I met Guillaume Tetu, the CEO of Hautlence, he was wearing a prototype of the HL Ti and I can still remember that my attention was constantly drawn to his wrist. 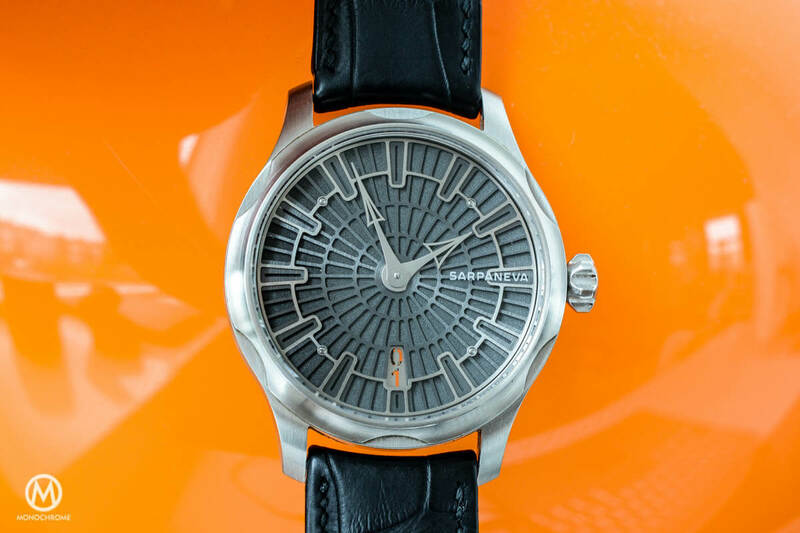 I couldn’t help looking at that watch and being absolutely mesmerised – mind you, this was the first time I had seen a Hautlence timepiece ‘in the metal’. The dial, the way to indicate time, the TV-screen shape case, and (what I later saw) the beautifully finished movement. After a long and relaxing lunch, Guillaume showed me the various manufacturing locations. I got to try the HL Ti prototype and see the spectacular HL2 that was about to be launched. It was quite an experience! After seeing that prototype HL Ti on Guillaume’s wrist, and trying it on my own wrist, I was sold… I guess you can say it was love at first sight. The price was, well…, ‘slightly’ above my budget, so I dreamt of the watch and was convinced it stay with dreaming and would never become part of my collection. A few years passed, Monochrome had evolved and I was about to quit my ‘normal’ job, in order to do Monochrome full-time. 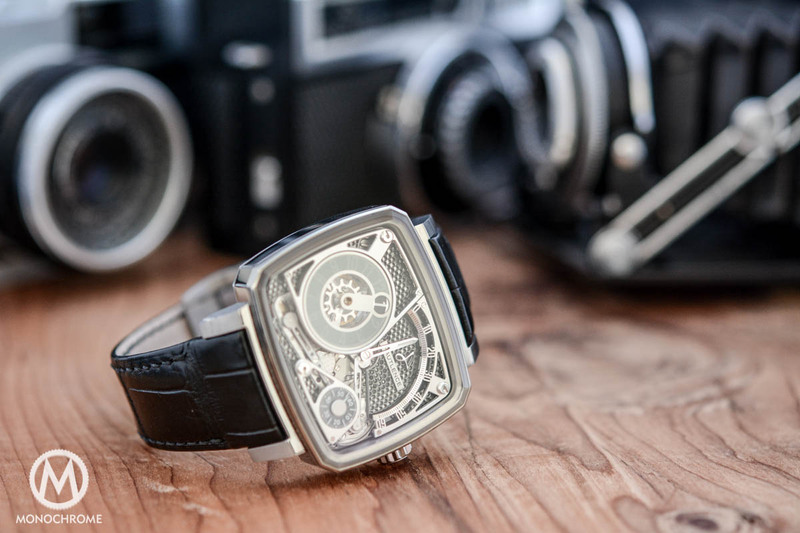 Up until 2012 I ran Monochrome in my spare time (during breakfasts, lunch breaks, evenings, weekends and my all vacations were spend at Baselworld, the SIHH and the occasional manufacture visit). The income from Monochrome had slowly increased and I still had my salary from my regular job. So this was the moment to get myself a dream watch, because I knew, as soon as I quit my regular job (I was policy advisor at the ministry of transport), the ‘lifeline’ of a regular pay check would be gone. This was the moment to make that one last ‘crazy’ purchase. Since the Hautlence HL Ti was still on top of my wish list, I contacted the brand and finally got my dream watch during Baselworld 2013. What stood out for you at Hautlence as a brand? On first glance I immediately had a soft spot for the TV-screen case. It allows for more space on the dial, and thus has enough space for complications or novel ways to indicate time, while it remains very decent in size on the wrist. This watch is certainly not big or bulky and wears very comfortable! The case shape was certainly one of the things that I immediately liked. Something that cannot be overseen is the way that Hautlence indicates the time, with a jumping hour indication and a retrograde minute hand, regulator-style meaning not on one axis. I do understand that not everyone is immediately drawn to such a piece, however I found it very, very intriguing. I kept waiting for the minute hand to reach “60” and see it bounce back to zero and at the same time see the hour disk make a jump to the next hour. Every time that happened was a small horological feast for me. These two key features immediately stood out, and, to me, still represent the brand’s most iconic features. That being said, even the spectacular HL2 and the (equally spectacular) new Vortex both feature the same way to indicate time, by means of a jumping hour and retrograde minutes. And these pieces also do not sport a ‘normal’ round case either! I also have to say that being in contact with a brand, especially with a small brand like Hautlence, the relation with the people from the brand is important. Meeting Guillaume Tetu, discussing the watch industry, his own brand, other brands and watchmaking in general, has shown me a bit of who he is, and I must admit that being in personal contact with a brand does help to appreciate it even more. Hautlence has an owner’s club, and being a member allows for some extra’s that just add to the entire experience. The HL Ti has a beautifully worked dial, how is the legibility? It is actually very good! Really, I do understand that many people wonder about this. Jumping hours, or at least a disk that jumps 30 degrees every hour, to reveal the next hour. A retrograde hand to indicate the minutes, which is done on a 120 degree arch. All indications are all over the watch’ face, so that sounds difficult. And admittedly, on first glance it is difficult. It took me maybe an hour to get used to it and now I read the time in a blink of a second. However I tend to look a few times, simply because I love seeing that dial. In the mean time I’ve worn many more watches with a different time indication (hey, we even dedicated an entire section to such watches, here on Monochrome) and most of are quite easy to get used to. It should be intuitively. One time I got myself a Glycine Airman, which is a 24-hour watch. 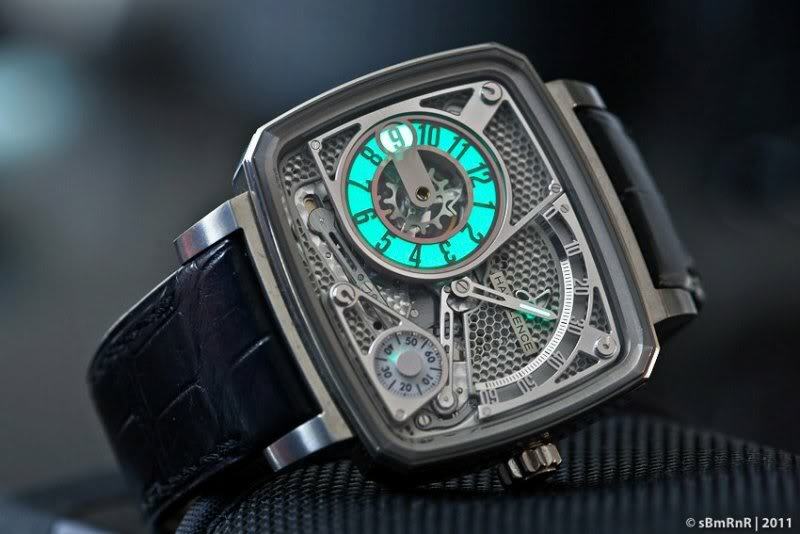 It has ‘normal’ centrally placed hands, however the hour hand only makes one revolution every 24 hours. That was something I simply couldn’t get used to. 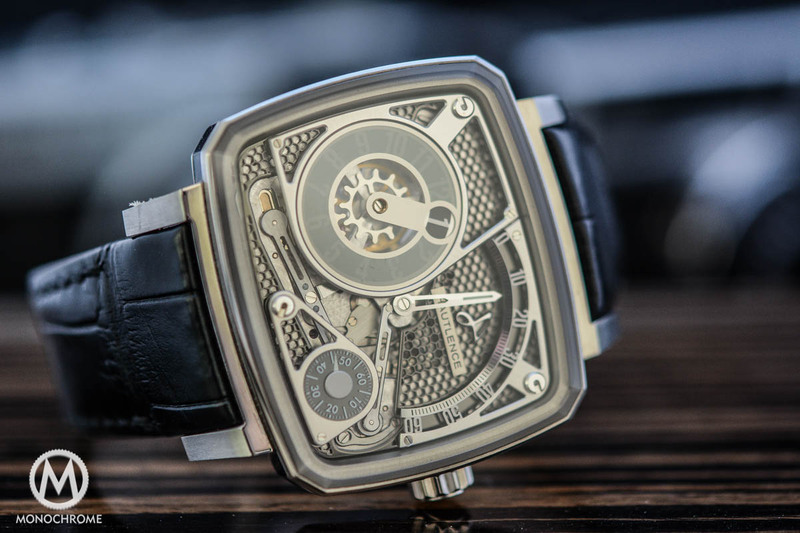 It has a fascinating case shape, can you tell us how its made and how it feels on the wrist? It feels great, and isn’t too large or bulky. The case is made in titanium and that’s very light. It is also quite scratch resistant, so even despite that it has been my daily beater for more than a year, it still looks like almost new. 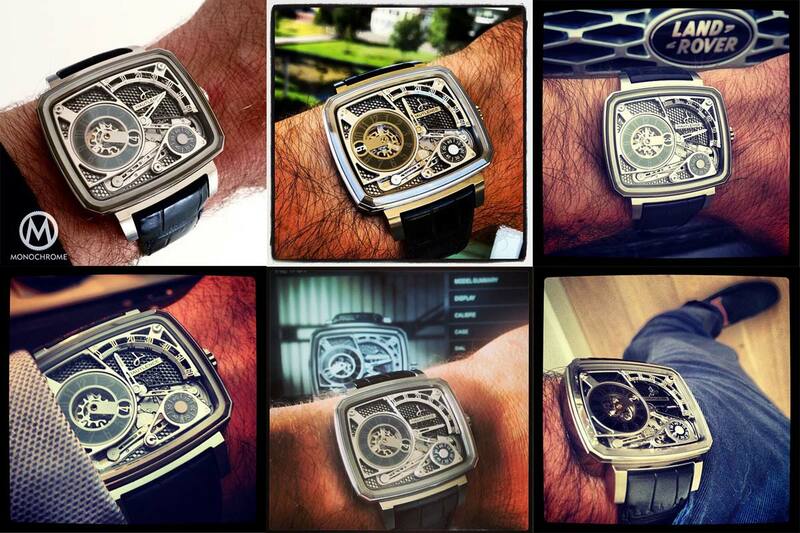 For those unaware – it’s a stunning movement and complex, can you tell us more? The mechanisms that make the hour disk jump, and the retrograde minute hand perform its hourly movement, is developed and manufactured in-house by Hautlence. The basis, being the main spring barrel, gear train and escapement, are from an ETA/Peseux 7001. 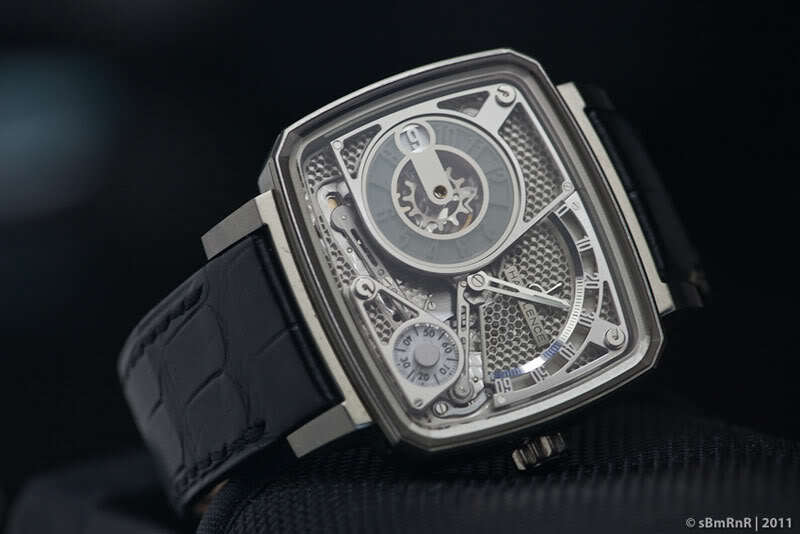 This ultra-thin manually wound movement was first launched in 1972 by Peseux, which was later bought by ETA, and is a solid and proven movement that delivers 44 hours of power reserve. Lots of great watchmaking heritage here. 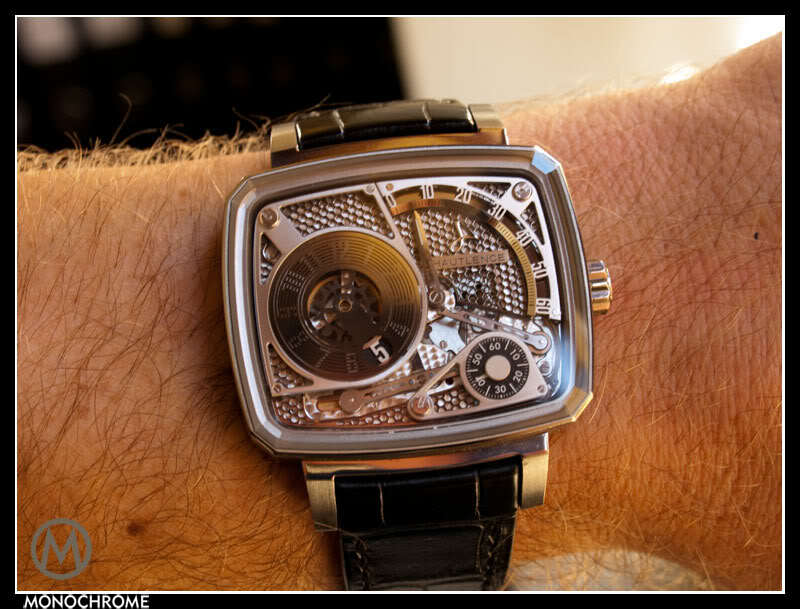 An interesting fact is that this same base movement is also used for the first URWERK timepieces. On top of these solid fundaments is a mechanism for the retrograde minute hand, and the Hautlence connecting rod system. When the retrograde hand reaches “60” it jumps back, and the energy of that jump will be used to let the hour disk turn 30 degrees to reveal the next hour. All together 206 individual component deliver 40 hours of power reserve, which is 4 hours less that a basic ETA 7001; this is partially because Hautlence wants to be able to guarantee the actual power reserve, and moving the retrograde system consumes more energy than standard hands. The finishing is all done by hand: hand-chamfered bridges with Côtes de Genève striping, pèrlage (circular graining) on the main plate, some of the plates are adorned with straight brushing, and the connecting rod system features both hand-chamfered angles and straight brushed surfaces. 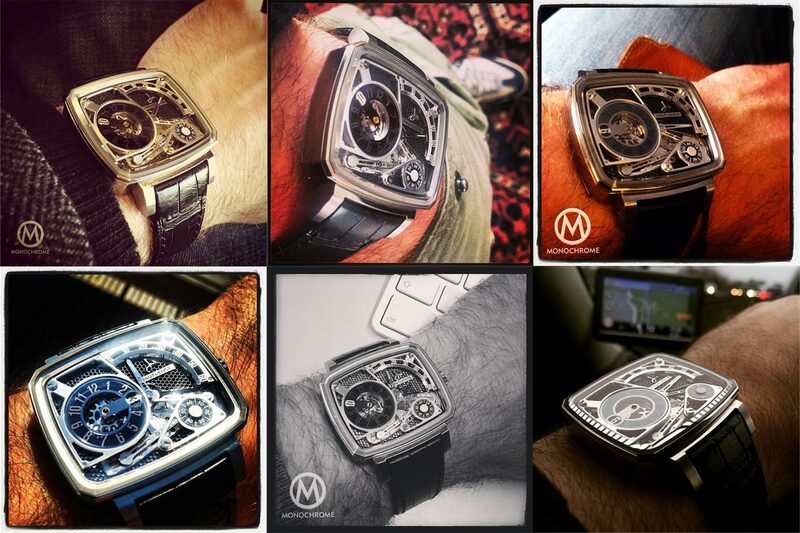 And that’s not all, the dial is also a work of art! 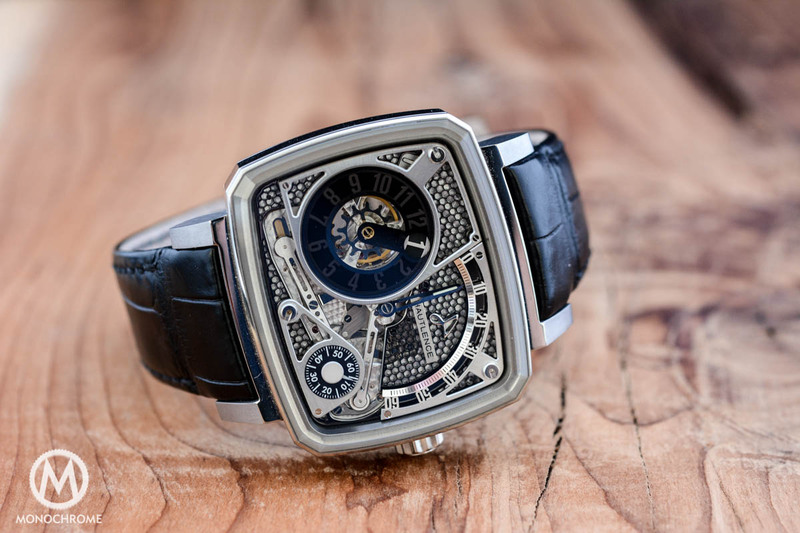 The ruthenium dial features a honeycomb motif (Hautlence was the first watch brand to make such a dial, which can now be seen on other brands as well) and a hand-applied HAUTLENCE logo. The hours, minutes and seconds flanges are open-worked and rhodium-plated, and the hour disk features a semi-opaque sapphire. All together the watch is a feast for the eyes! It still gives me a huge amount of pleasure every time I check the time. An area I struggle with as a collector is thinking too much about how the aesthetic/design of a watch may ‘fit into’ my collection, do you share my concerns? Hahaha, certainly I do understand that, however I actually never saw that as a problem. For me it was ‘love at first sight’ and that was the only factor that was of any importance to me. I’m not ‘building’ a collection of, for instance, only pilot’s watches or diver’s watches or dress watches. I get as much satisfaction and pleasure from my Hautlence as I get from my 34mm round white gold Patek Calatrava from 1960. 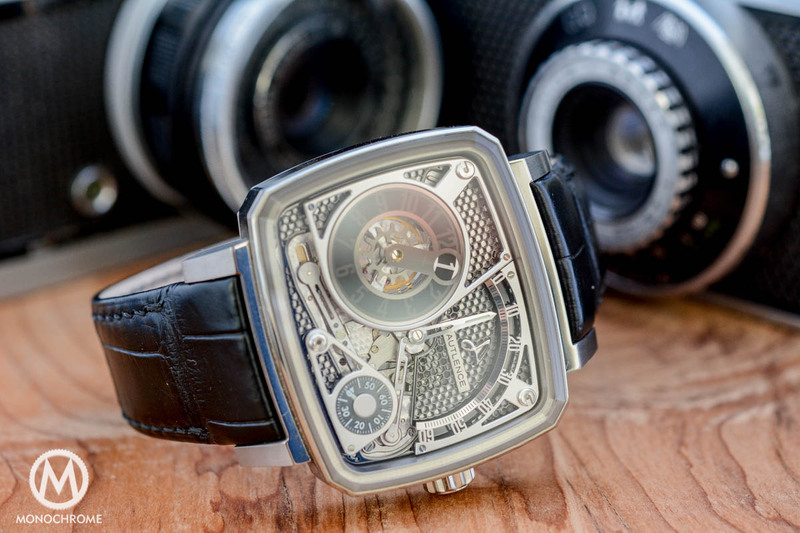 The Hautlence must attract onlookers, what do people ask you the most about the watch? That really depends on how experienced that person is with watches. Funny enough when I just picked it up, we drove to Gruyere for a nice day, and during lunch this lovely young lady, who was sitting at the table next to us, out of the blue said that she loved the looks of my watch. She had no idea what it was, or how to read the time on it, or whether it’s an expensive watch or not. She just loved the looks of the watch. People with more “watch experience” often ask how the time is indicated, and they’re interested to hear how reading time on a daily basis actually is. 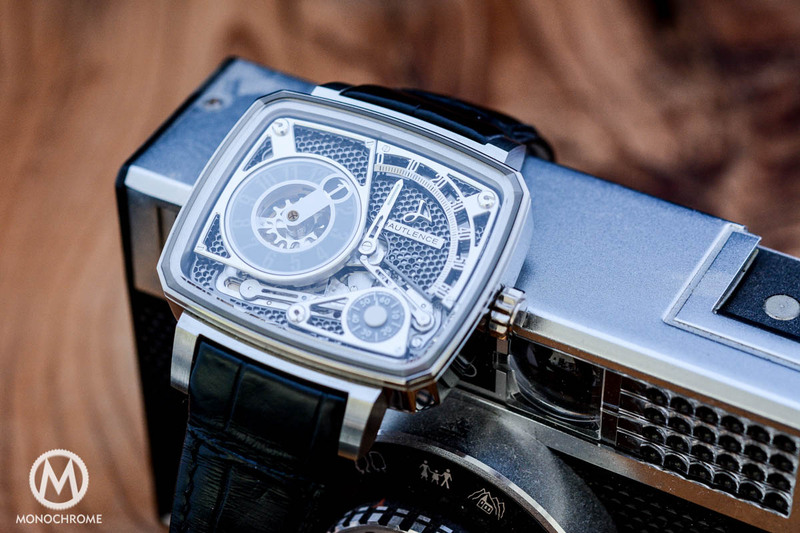 The Hautlence HL does attract some attention, and questions and remarks are rather divergent. When it comes to value for money, where is the Hautlence? Value for money can be explained in several ways. There’s of course the resale value and there’s the factor of how much work or ‘unique content’ you buy for your money. When I buy a watch, I do not take resale value into account, and my choice and decision is entirely based on passion. Since I think that watches should be worn, and not only kept in a safe, I choose watches that I love to wear. So the factor ‘resale value’ is not really a factor that I take into account. The other factor – what you get for the money – is one that I take very serious. And that’s a factor where Hautlence scores very high! The Hautlence HL Ti is quite unique to start with. I guess that 99.9% of the watches out there have a round case and the Hautlence has a so-called TV-screen case. The way to indicate the time is unique and the company has developed, designed and manufactured the mechanics for this, meaning these are all custom parts, specifically made for the Hautlence HL series. The quality of actually everything in this watch is extremely good, and looking at the finished bridges always brings a smile on my face. In your opinion will it be a design we appreciate in years to come? I think that anything other than a round watch with central-placed hands will never become the mass’s favourite. 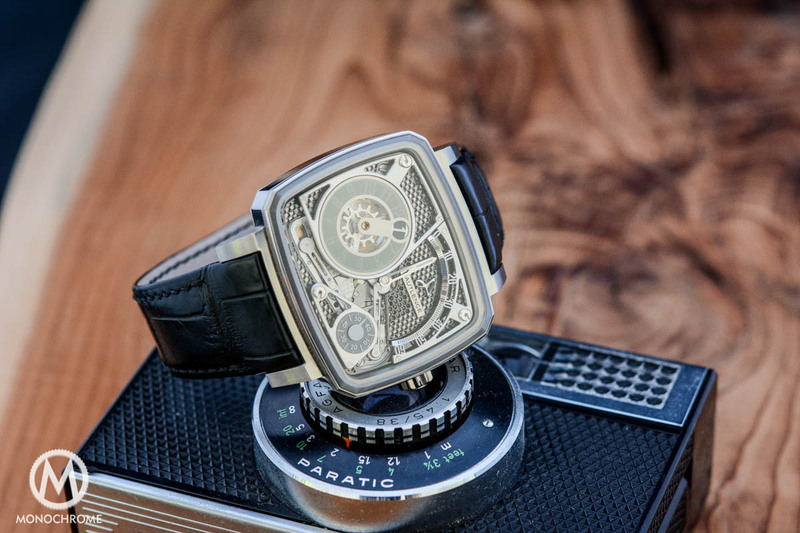 Let’s be real about this, crazy watches with a novel time indication like my Hautlence HL, but also like HYT, MB&F and URWERK are offering, will certainly be admired for the unique features, daring design and boldness. Its design is not typically something from a specific era, and I consider it to be art, modern time-telling art that is. 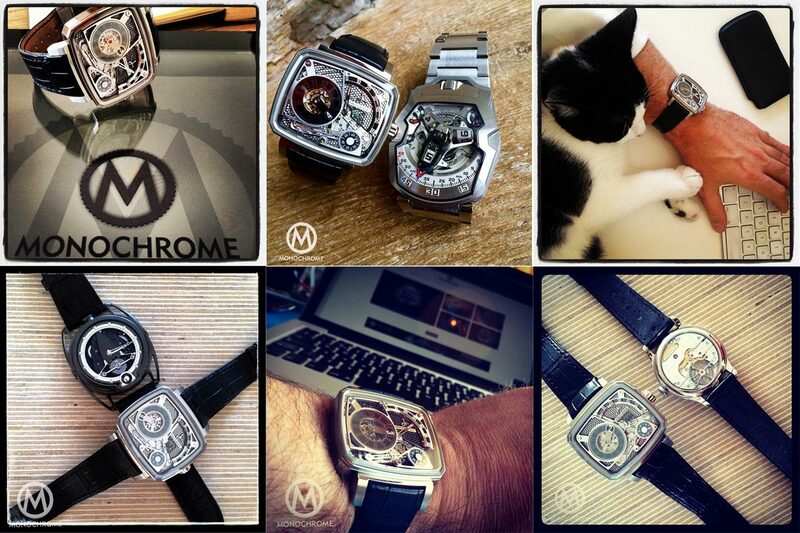 Like HYT, MB&F and URWERK (and several others of course!) 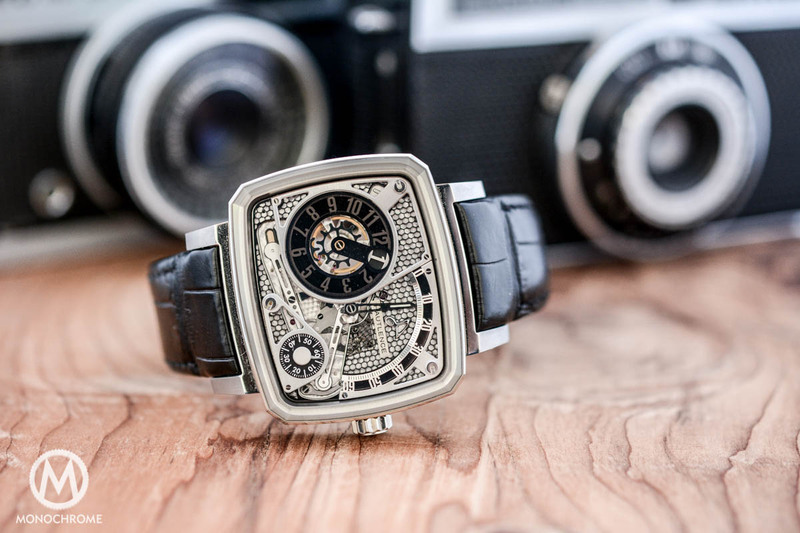 these kind of time-telling art for on the wrist, will be admired and appreciated and are not likely to become outdated like watches from fashion brands. Does it get much wrist time? The first year it got over 90% of my wrist time, so you can certainly say that it was my daily beater. In the past years I’ve been wearing a lot of review watches, so my Hautlence got less wrist time. And since my son was born last year, I’ve actually mainly worn my Tudor Black Bay because it’s better suited for a daddy’s life (washing hands a gazillion times a day, changing diapers, putting him in bath, my son grabbing that shiny thing on my wrist, etc). Now my son is just over a a year, I’m starting to wear the Hautlence more because daily risks have gradually reduced. In the 2.5 years that I’ve own this watch I take a lot of wrist shots and shared them on Instagram (see below for another collection of Instagram photos). What is your favourite feature of the watch? The dial, or (I know this is cheating) everything that is going on on the dial. I love it. How the light changes the looks of the watch and there’s always a new angle that just looks superb. One final question…. What three words would you use to describe your HL Ti? Horological Wrist Art. I can go on about this, because it’s actually a factor that I admire so much about Hautlence and several other brands that I mentioned before. It steps away from the classical wrist watch, both in shape as well as in the way it tells the time. Yet it is solidly based on the fundaments of watchmaking that have been laid out in the past centuries.